Where to start? My plot is too small to stick to a strict rotation plan but it's useful to look back year on year to see where crops were planted and try to give the soil a breather. So I always start by drawing up rough plans for both allotment and veg patch as I can't see either garden from indoors. Being naturally optimistic, I've a tendency to overestimate the number of plants I can grow in the available space. With a sketch, I've got the garden to hand whenever I need it; I map out the perennial plants, see what needs to be moved or replaced, and plan where to plant this year. If I've only got 30 minutes to get outside, I know exactly what I can achieve in that time. Yes, I know I could walk the plot and get an idea that way but that goes right out the window when ordering seeds - just now when looking online at sweet peas, I was totally distracted from my purpose by seeds for a caper plant. I resisted because, in a few months time, I'll be wondering where I'm going to plant all these seedlings. This way I can at least try to keep it real. So I've got my garden plan on paper. (Actually, i-pad, which I love.) Next, for both the veg patch and allotment, I've made a list of all the food I want to grow this year and then plotted those foods onto the plan, checking them off my list as I go. I was quite surprised to see how much I could fit into my relatively small growing space - the veg patch is just 10 metres x 3 metres (32ft x 10ft). I'll sow fast growing carrots inbetween slow growing onion sets; spinach likes a shadier spot in the summer so will grow under climbing beans; kale and broccoli will be planted out when the broad beans come out, a border of spring onions can line the path. Tomatoes are companion plants for asparagus. Etc. You get the idea. So now I know what to grow and where to put it. Now I can think about seeds. There are a few seeds that can be sown in February (under cover, of course), otherwise it's the perfect time to empty out the seed box and see what I've got before I settle down to mark up seed catalogues. I find it incredibly easy to be tempted into overspending - I currently have four types of spinach, 6 types of beans ... I could go on but I've said enough. 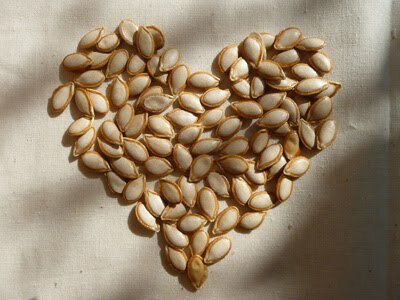 So, first off, I went through all my seed packets and steeled myself to discard any that were past their sow-by date. That's a tough one as seeds can be expensive but it's important. As with any living matter, seeds age (especially if they're stored in an old box on a warm shelf), and with it a significant reduction in the likelihood of successful germination. Who needs to watch soil for signs of life only to find two or three weeks later that it's a major fail? The Real Seed company, who positively encourage seed saving, have a page which gives the estimated life span of certain seeds. Very useful. That page is here. Favourite seeds past their best that need to be reordered I put into a separate reminder pile. Seeds where I couldn't see a best before date or remember how long I'd had them went onto the 'chuck' pile. I found that several companies put no dates on their packets; others indicate only when the seeds were packed. This means seeds labelled as packed in 'year ending March 2016', could have been packed in April 2015 so are unlikely to be viable in March 2018, although it might be worth a try. Growers choice. Having walked that path before with limited success, I'd rather replace those seeds. This year I'll be writing the purchase date on every new packet to give my future self a huge clue. So now I have a pile of viable seeds. Do I want all of them? Probably not. 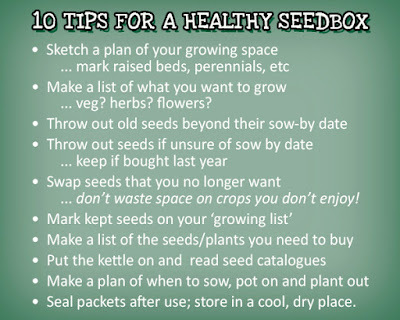 Most of the free seeds from magazines or trade shows will go to a seed swap. There's also seeds that didn't do well for me (Cherokee Trail of Tears beans) or the end product didn't justify the time and space. Or I've seen a new variety that I want to try, so the current ones won't get used. These are all valid reasons to reassess what I've got. Topped up with regular rounds of hot drinks and toast, it's a very cathartic exercise for a wet (or snowy) afternoon when I don't fancy being outdoors. With a decluttered seed box and a list of what to order, finally I turn to the seed catalogues. I'll always want to try more seeds than are on my list but, armed with a wishlist to make notes and The Plan, I'm far less likely to succumb to temptation. I've noticed that a few magazines have got calendars of when to sow and harvest crops. 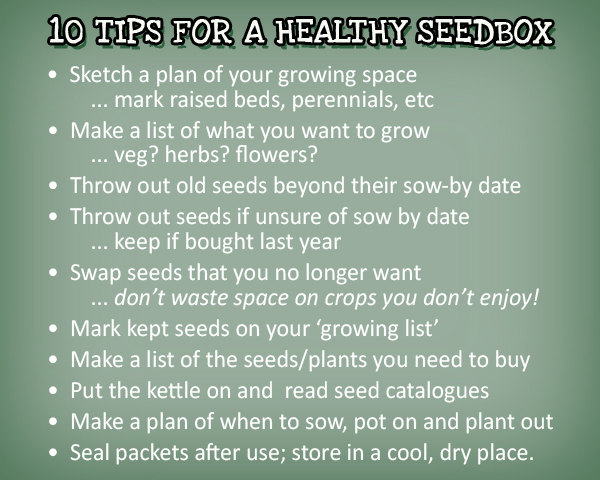 This is very general and depends on the weather and soil temperature where you live but my next job will be to organise my seeds by their sow by dates and note that in my garden diary. How about you? Do you reorder everything fresh each year or try to use what you've already got? I feel a bit silly writing a review of 2017 a couple of weeks after the new year started and long after I started planning for 2018 but, while it seemed there was a lot to be glum about last year, looking back I've found quite a bit to perk me up. I want to park my thoughts on last year so, in no particular order, here we go. We're well into the beginning of January (or, as I prefer to say, half way through winter) but I trust you all had a really good christmas and New Year? I did. And, possibly for the first time ever, the tree was bought and decorated in good time, looking all twinkly and festive for many days before the big event. A good start to christmas - and, perhaps, a good end to the year. The tree is now down, along with a tsunami of needles which dropped as I took the tree outside, the decos have been carefully wrapped and restored to their box on high, the indulgent puddings a distant memory. My new garden notebook has arrived and a stock take of the seed box is imminent - before I settle down to read through seed catalogues. I've got a good feeling about 2018. I started thinking about the year ahead in the breathing space between christmas and new year; without becoming overly optimistic, I'm feeling a renewed sense of purpose and excitement when it comes to gardening. Last year, there were too many personal and work issues which threw a proverbial spoke into my wheels, but I'm nothing if not a gardener, so ... new year, fresh hope, clean slate. Moving forward with intention. Sounds good, yes? Every year there are lessons learned and thoughts to bring into the next round of growing so I'm taking a moment to look back at last year because, well, it wasn't all bad. Meeting other garden bloggers was a definite highlight; what could be better than chatting to people whose writing and opinions you admire and, let's face it, who'd pass up the chance of a good garden chat! We bloggers are a fun bunch too. 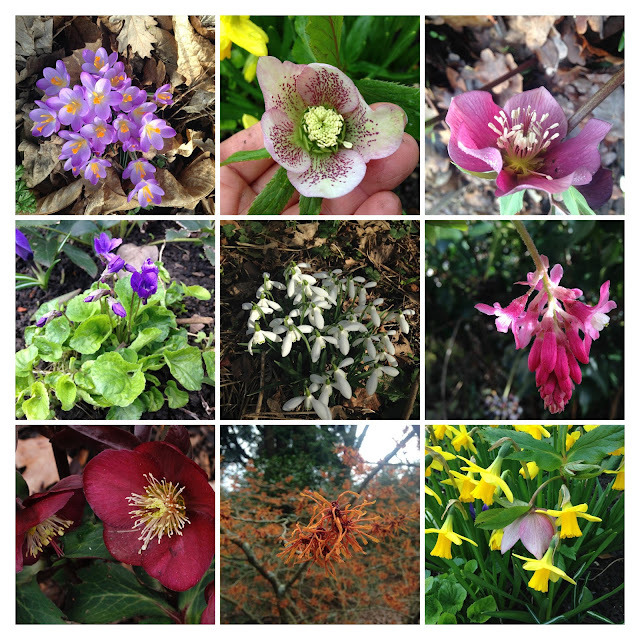 The Garden Bloggers group on Facebook and Twitter was set up in 2017 and has become a really good way to connect with other bloggers - including the end of month #gdnbloggers chat on Twitter. Worth checking these out if you're not already familiar with them. There's even a small (real life!) meet up planned for early April this year at the Great Dixter Plant Fair, if you're down Sussex/Kent way - check out the Facebook page. (best to let this last one dry on the stem for deep colours). More achocha (top middle) than I could eat! I do love a garden visit, particularly walled kitchen gardens which, for my money, reign supreme, but it takes organisation and time. 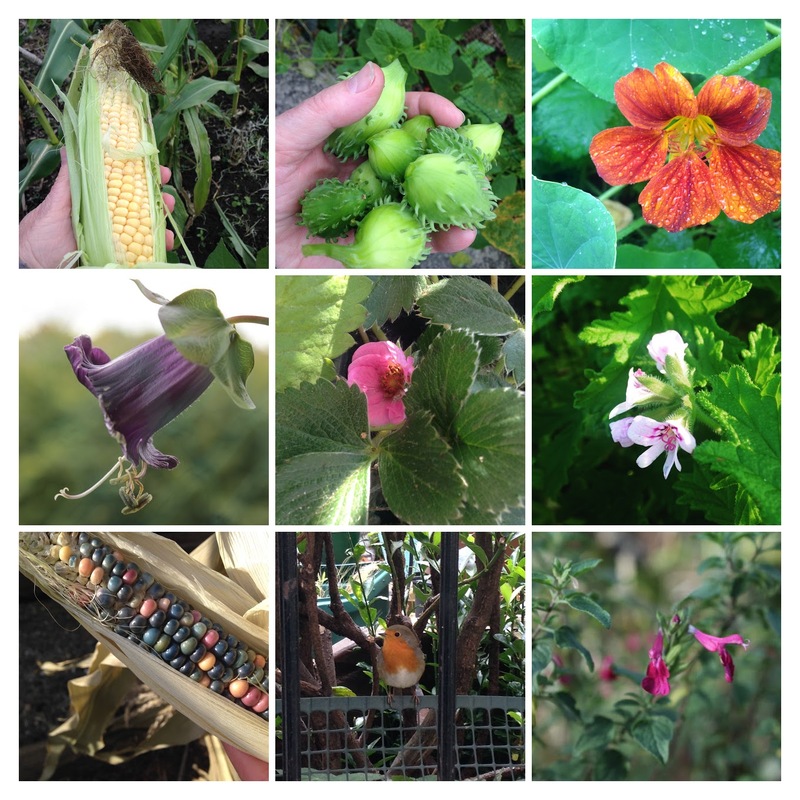 Last year, I squeezed in trips to West Dean in Hampshire, Winston Churchill's kitchen garden at Chartwell in Kent and the Skip Garden in Kings Cross, and came away inspired and motivated. The herb, veg and trial gardens at RHS Wisley are also worth visiting throughout the year, although last February my mission was to see the winter borders and to recharge my happy zone with a splash of spring colour on a sunny day. It's a day out that delivers. Likewise Waterperry in Oxfordshire (an hour's drive for me) - lots to delight in during the summer but I also went in February when I was thrilled by carpets of snowdrops leading to the river walk and the surprisingly beautiful and thoughtful sculptures along the path. 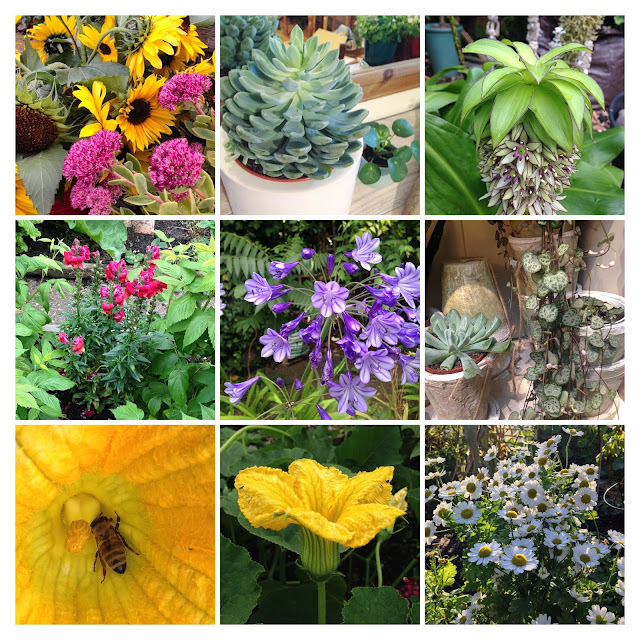 There were other visits last year that stimulated ideas of good plant juxtapositions or unusual plants that will happily grow outside. I was thrilled that I managed to get to Tom Hart-Dyke's World Garden in Kent last September before driving on to Great Comp to see the collection of salvias and dahlias. I saw flamingos wading through the water high above the traffic of Kensington at the Roof Gardens during the GMG summer social and ate cake with Rosemary Alexander (founder of the English Garden School and prolific teacher/author/designer) in her Hampshire garden - one of the garden visits organised by the Garden Media Guild. I've been a probationary member for over a year now and these GMG group visits are a real perk of membership as we're often the only people in the garden, with behind-the-scenes tours from the head gardeners. In any gardening year there will be moments of bliss counterbalanced with frustration but, in 2017, I experienced more low points than anticipated. Involvement with helping at the allotment diverted a lot of my time from my gardens at home, something that needs to be rebalanced this year. 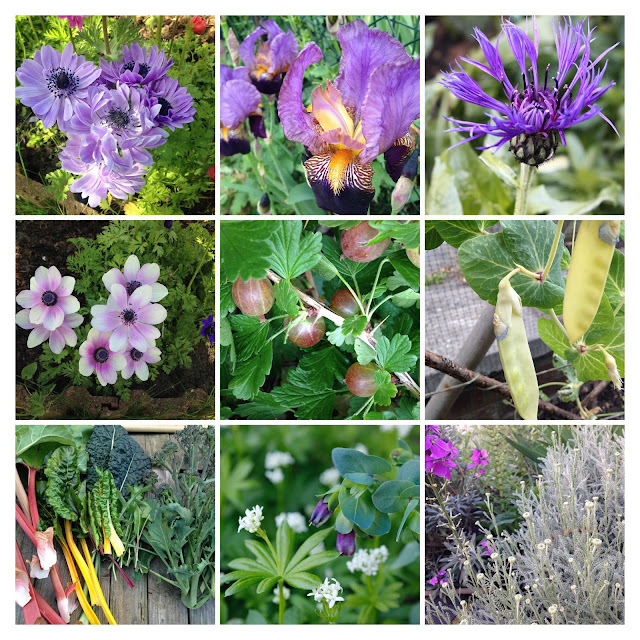 Despite that I managed to grow some wonderful flowers and vegetables, including several new plants that will go back onto this year's plan. 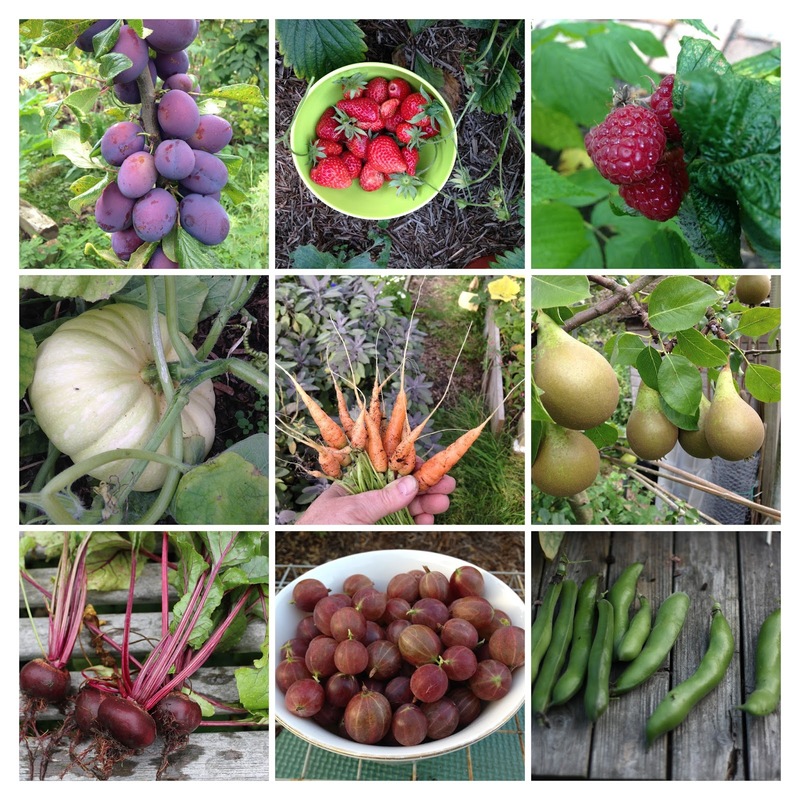 Even a badly managed plot will produce harvests! A few were new to me plants - glass gem corn, Edamame beans, Tiger Nuts (chufa), Squashkin, Honeyboat Squash, Old Boer White squash, Cobaea scandens (cup and saucer climber), pale mini courgettes, 'Berries and Cherries' strawberries from Thompson and Morgan which have deep pink flowers and delicious small fruits; I grew those on my balcony but will transplant them to the garden this year. Some highlights: My sweet red gooseberries finally fruited in abundance which was very thrilling. I had masses of lovely big Polka raspberries from the veg patch, sweet corn from the plot, squashes! yay!, superb plums from the plot (made into delicious crumble), autumn baby Nantes carrots (well worth resowing in July to get these). Cavolo Nero and curly kale was left to go to seed (the bees love the flowers) but continued to sprout baby leaves and are still growing strongly, and being picked, one year on. The plants I brought to London from Mum's garden flourished - agapanthus, lily of the valley, eucomis, geum, pieris - all flowered and looked very healthy last summer. Croix lachryma jobi (Job's Tears) bead plants from 2016 regrew as well although there weren't as many beads, probably because I moved the plants into a pot. Job's Tears are not edible, unless you want to grind your own flour, but can be strung together to make bracelets. I advise using a thimble. The daily smile came from several Cobaea plants climbing through the pigeon netting on my balcony where I could see the flowers turn from pale green to purple at eye level, and the huge Scented Pelargonium which scented the air every time I shoved my way past it to step into the veg patch. Not so good: There were (are?) whitefly of biblical proportions feasting on my balcony salad and herbs; I'll have to clear everything, scrub and start again. Edamame beans seemed to be okay then struggled to grow and were finally taken down by slugs. Courgette and kale seedlings in the veg patch were eaten overnight, probably also by slugs - literally down to a stump - so I had to start again there. No french beans only broad beans, lovely Braeburn apples were all pinched before they could ripen (and so discarded with one bite taken out, grrr), ditto pears, five quince this year but all went rotten on the tree before being fully ripe, no plums (again) in the veg patch (but loads from the plot). As the veg patch plum trees have never fruited in eight years of growing, they're for the chop any day now ... especially now I have my chainsaw! I started several Physalis (Cape Gooseberry) plants from seed; it looked like I would have an abundance of fruit but none of them ripened before the frosts. Those plants were at the allotment where I thought they'd get more sun but it seems they prefer warmth over sunshine. Next year they'll be back in the veg patch. Leeks were a disaster. And I never got round to sowing any broccoli so no purple sprouting for me this year - unheard of! Having never had any luck with houseplants, I dived in for another go, having discovered a few beautiful houseplants at Petersham Nurseries' new Covent Garden store. There I bought a 'String of Hearts' to add to my existing Jade plant (even I haven't been able to kill that one off) - and even got round to repotting Jade into new soil this year. I soon had a little collection of indoor plants to look after - crassulas, an aloe, jade plants, an echeveria and pilea peperomioides, the Chinese money plant. There's even a cardamom plant, for now. So far they're all surviving on a lack of attention and the merest hint of water. There were honours, which was a bit bizarre. In January, I was amazed to be told that this blog was listed in Gardener's World magazine as one of 50 new things to try. (I'd never have known but a friend has a subscription to GW.) That's quite an honour given the circulation of the magazine but really bad timing as, having spent a few emotional months clearing my parents' home, my absence here was noticeable. I can only hope that anyone checking out the link stuck around but I seriously doubt it! So, there we have it. Another year gone, another year older and, with luck, wiser. Thank you to everyone who read, commented and generally made these pages a nice place to be - it's truly appreciated and I love getting you know you all! Wishing everyone an excellent year ahead, may the garden gods smile on you.